Official: Qaddafi spy chief in Mali; Son next? DAKAR, Senegal - Muammar Qaddafi's intelligence chief, who is wanted by Interpol, fled to Mali overnight after making his way across Niger where he has been hiding for several days in the country's northern desert, an adviser to the president of Niger said Thursday. The official, speaking on the condition of anonymity due to the sensitive nature of the matter, said that Abdullah al-Senoussi entered Mali late Wednesday night via the Kidal region, which shares a border with Niger. He is guarded by a unit of about a dozen people and arrived in a convoy that was piloted by ethnic Tuaregs from Mali. 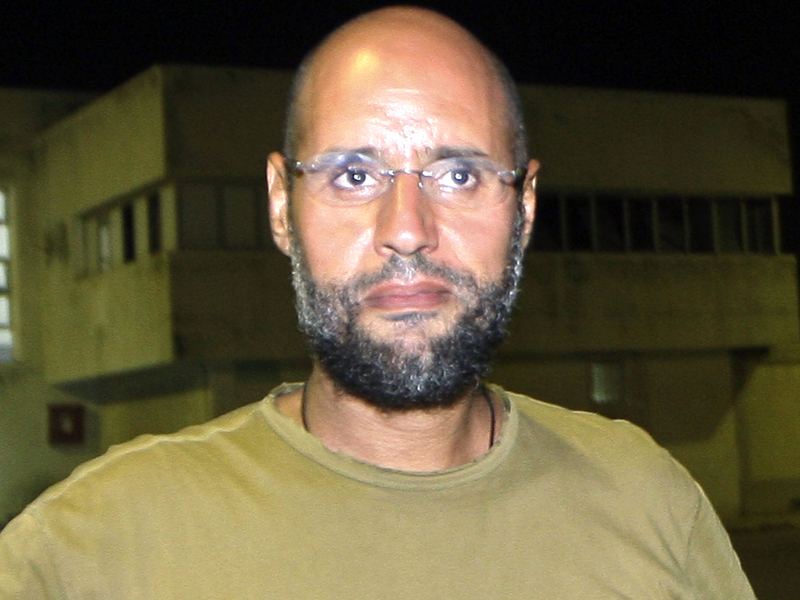 The official said that Qaddafi's hunted son, Saif al-Islam, is also on his way to Mali and is traveling across the invisible line separating Algeria from Niger. The area, an ungoverned expanse of dunes stretching for hundreds of miles, has been used for years by drug traffickers as well as by an offshoot of al Qaeda. "Senoussi is in Mali ... he arrived yesterday," said the adviser, an influential elder in the ethnic Tuareg community which overwhelmingly supported Qaddafi and remained loyal to him despite Niger's official stance backing the country's new rulers. "Saif is going to Mali too. He is right now between Niger and Algeria. He is in the territory at the frontier between the two, heading to Mali," the adviser said. "For the moment, they do not plan to approach the government. They are protected by the Tuaregs ... and they are choosing to stay in the desert." Speculation about Saif al-Islam's whereabouts has been rampant in recent days, with Transitional National Council officials claiming he is planning to turn himself in to the ICC. On Thursday, Reuters reported on a TNC official's claim that Saif al-Islam is looking to arrange for an aircraft to transport him to The Hague. However, none of these claims have been confirmed. Meanwhile, the U.N. Security Council has voted unanimously to lift the no-fly zone over Libya on Oct. 31. NATO has been expected to announce the end of military operations in Libya but has not made an official statement. The region through which al-Senoussi and Saif al-Islam are said to have traveled is the traditional home of the Tuaregs, the desert dwellers whose members live in the nations abutting the Sahara desert from Mauritania in the east, through Mali, Niger, Libya and Chad. The group felt a kinship with Qaddafi who elevated the nomadic life by pitching his tent in the courtyards of four-star hotels in Europe. Hundreds of Malian and Nigerien Tuaregs were recruited by Qaddafi to fight as hired guns in Libya in the final months of the conflict. The video showing how Qaddafi was manhandled after he was caught has deeply offended Tuareg communities throughout Africa. Starting at dinnertime Wednesday, Tuareg elders met in Agadez to discuss the conflict posed by the arrival of Qaddafi's most trusted collaborators in light of the Niger's government's commitment to hand over anyone wanted by the world court. Both the son and the intelligence chief are wanted by the International Criminal Court which issued warrants for their arrest in May for crimes against humanity committed during the monthslong struggle for power in Libya. About 30 other regime loyalists, including another Qaddafi son, al-Saadi, fled to Niger in September, but were apprehended by Niger's government and placed under house arrest. "We are hearing the same reports as you, that Saif is in our zone. But our security forces have not run into him," said Massoudou Hassoumi, the chief of staff of Niger's President Mahamadou Issoufou. "The day that we run into him we will arrest him. He is pursued by the ICC, and we will hand him over in keeping with our international obligations." In Mali, a tribal elder from the country's north where the fugitives are believed to be hiding, said that he doesn't think Mali will shield them from the ICC. "People on the ground are saying that Senoussi is there," said the elder who asked not to be named because of the delicate nature of the issue. "I don't know if Qaddafi's son is there too. It's a small group of vehicles which is to the northeast of Kidal Town. It's possible that they are with other Tuaregs who have returned from Libya," the elder said. "I think they know if they came here that Mali is going to hand them over to the ICC. In fact I think that's why they came here because they want to be safely handed over." Niger's government, which is heavily dependent on aid, has been put in an impossible spot, forced to choose between its obligations to the international community and its powerful Tuareg community. The problem is similar in Mali, but President Amadou Toumani Toure is at the tail-end of his second term and is not seeking re-election, making him possibly freer to choose a course of action without fear of political repercussions.